Normally, World Youth Day is held in August, however, this year in Panama it was held in January. In August, most students in the northern hemisphere are off from school, and those in the southern hemisphere are in session. Almost 750,000 young people attended this event in Panama, the majority of those from Latin America as this World Youth Day was meant to accommodate their inability to be present in the month of August. The World Youth Day held in Denver, Colorado, in 1993 was almost a prototype of what was to come for the following years. Pope John Paul II embraced this means of encounter with young people and brought the event to new standards as he became almost a rock star for young Catholics. To encounter the Holy Father and hear his message, and also to receive catechesis, is so important to their growth as young Catholic women and men. In the general order of World Youth Days, the pilgrims arrive at the beginning of the week and attend various catechetical sessions. I am proud to say that the Diocese of Brooklyn was well represented in Panama with almost 200 participants. These young people attended these catechetical sessions and I was privileged to be with them on Friday, January 25, a day dedicated to reconciliation and reparation of young people for the sacrament of reconciliation. On the first day I arrived, I was able to join our entire delegation, as well as some delegates from the Archdiocese of New York, for dinner at the restaurant overlooking the Miraflores locks at the Panama Canal. We know Panama because it is famous for the canal. Panama is now a flourishing country whose main asset is the Canal, especially with the addition of the larger locks that accommodate the much larger ships that today seek a quick passage between the Atlantic and Pacific Oceans. It is wonderful to see the marvel of the engineering and witness the transfer of ships from lower to higher ground. The Panama Canal’s history is one where many laborers gave their lives in the malaria-infested swamps that needed to be cleared in order for the canal to be built. The passage of freight through the canal has enabled the world economy to grow into the globalized economic system it is today. At the Friday Mass, I was joined by the Auxiliary Bishop David O’Connell of Los Angeles. Our pilgrims had a view of the bookends of our country; the East and West Coasts. The purposes of World Youth Day is to challenge young people to consider their vocation as Catholics; in a married life, single life, priesthood or religious life. The vocational dialogue that took place before the Mass between the 8 or 9 priests who attended, myself and our Auxiliary Bishop Octavio Cisneros, was a useful afternoon. We gathered all of the delegates together and began a general dialogue about faith and finding God’s will in our lives. The theme of this World Youth Day was “I am the servant of the Lord. May it be done to me according to your word,” following Mary’s example as she was given the message from the Archangel Gabriel that she was to be the Mother of God. How important it is for everyone to find God’s will in our lives, especially for young people, as they look forward to their future. Our youth certainly struggle to understand to what vocation they are being called. After the general group discussion, we broke up into a young women’s group and a young men’s group. The young women had the opportunity to speak with two religious sisters who were in attendance, as well as some of the female leaders of the group. While Bishop Cisneros, the other priests and I spoke with the pilgrims, we were moved by them. Young people of this generation, especially those who now have made the effort to come on pilgrimage and seek the place of God in their life, are truly inspiring because of their honesty. The follow up for those discerning a vocation to the priesthood or religious life means finding support for their discernment. Past research conducted by St. John’s University made us realize that one of the missing elements for most young people is the support system where they can find the guidance necessary to discern their vocation, especially in the conflicting atmosphere in which we live today. 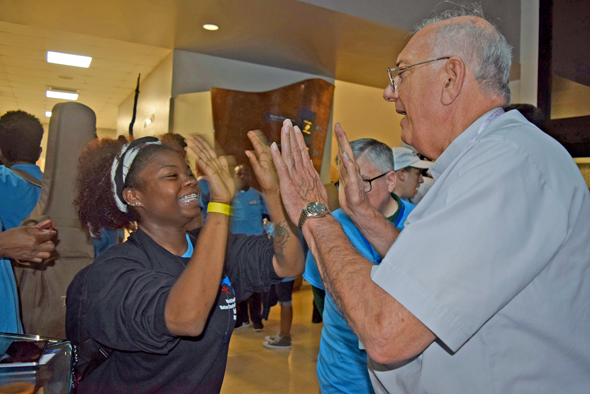 I take this opportunity to thank Father Gerard Sauer, diocesan pilgrimage director, and his wonderful team who served as chaperones for the event, as well as the parish leaders who accompanied our young people. I also thank Father Sean Suckiel, Vocation Director, for his special support of all those in attendance. Our delegation was one of the largest from the United States as it has been in the past. Our pastors and parishes support our young people through fundraising efforts and encourage them, as well as the financial assistance that comes from the diocesan foundation and the Catholic Foundation for Brooklyn and Queens. The Closing Mass with the Holy Father was an early morning celebration. During the Prayer Vigil of the night before, young people are addressed by the Holy Father and then spend the rest of the night in adoration of the Blessed Sacrament. Over that night, more than 500,000 young people slept out under the stars on the ground of the park where the Closing Mass was held. Pope Francis challenged the young people to truly seek the will of God in their lives, and to have the courage to follow it. A three- to four-hour walk took the pilgrims from Panama City to the place for the vigil and their overnight stay. This journey enhanced their sacrifice as a pilgrimage helped them to recognize that the best decisions sometimes are made away from our normal surroundings. When these decisions are accompanied by a certain penance, they are truly fruitful. The Bishops left our hotel at 4:00 A.M. to arrive at the site to be there in time for the Mass with the Holy Father. Needless to say, Sunday was a grueling day since I traveled back to New York that evening. Being with our young people for the Mass and hearing the inspiring talk of the Holy Father, however, made that day easier for all. Pope Francis truly inspired the young people, as he himself seemed very upbeat and energized by the presence of so many young people who gathered together. Panama certainly was most welcoming, not only its Church and people, but also the government officials who visited Cardinal Dolan and me weeks before the event. A pilgrimage, by definition, is leaving the safety of the shore to find the deeper waters where tranquility and safety have been left behind. It opens pilgrims to a better understanding of God’s call to them. 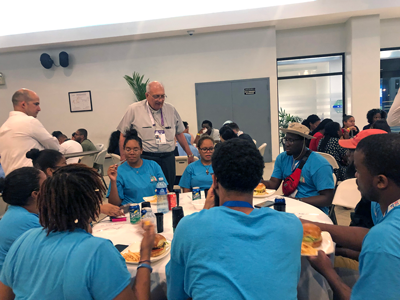 Please join me in praying for the young participants of World Youth Day who certainly put out into the deep on their journey to Panama in search of a deeper connection with God. In our follow-up events, we will keep in contact with our young people and assist them in their journey of faith as we helped them on their pilgrimage of World Youth Day Panama.